When you want an engine and/or front brake upgrade, buying a half-cut from a wrecker has always been a great way of sourcing the bits. But these days, is there an even better way? With the reduction in the cost of used cars, and changed regulations relating to the re-registration of seriously accident-damaged cars, we think so. Recently, I needed to source a new engine. Or a second-hand new engine anyway. When in the past I’ve been in this situation, I’ve always bought a half-cut imported by a wrecker from Japan. That is, a car that has been cut off from the front seats forward – you get the front suspension and brakes, driveline, dashboard, engine and dash wiring looms, and ECU. But when I recently started looking around at available half-cuts, the range seems much reduced over what was available five or 10 years ago. And for anything desirable, the prices (up to AUD$3000) seemed a bit over the top. That was especially the case when I considered what I needed for my project - all the brakes (not just the front ones), plus the fuel pump and charcoal canister. It seemed that $500 or $1000 could be easily added in sourcing the bits that a half-cut wouldn’t give me. So is there another way? 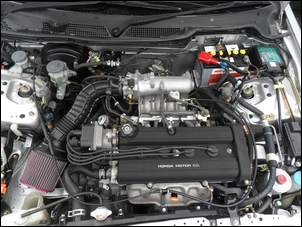 The answer depends a bit on how common the engine is that you need, but if it’s a car sold locally – then yes, there is a much better way! 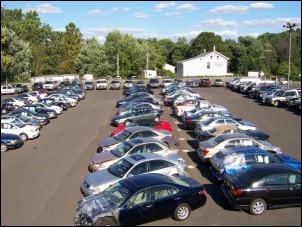 The answer is to buy a complete car at a salvage auction. 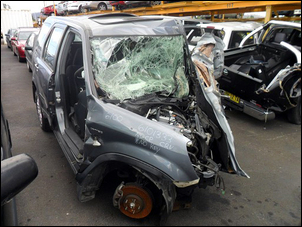 The cars are categorised in two ways – a repairable write-off, and a statuary write-off. 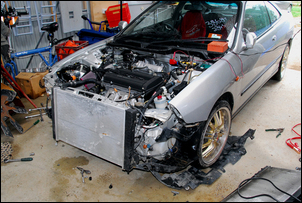 A repairable write-off, as the name suggests, can be repaired and then be inspected and re-registered. A stat write-off cannot, under legislation (here in NSW anyway) be re-registered. Stat write-offs are usually the more damaged of the two categories, and also because they cannot be put back on the road, are cheaper. Like any auction, the sale price depends on demand. 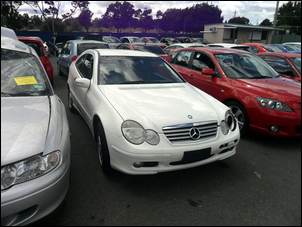 At salvage auctions you’ll find that mainstream, low kilometre, repairable write-offs go for decent money. (In these cases, the sort of dollars you’d pay for a similar crashed car on – say – eBay.) But higher kilometre cars that are older or less mainstream are much cheaper than you first might expect. Stat write-offs are all over the place in terms of sale price. So who is buying these cars? People looking for donor parts for a project are a minority – most buyers are crash repair shops and wreckers. This means that the value criteria being applied by people after a donor car are different to most buyers… and that’s a good thing! If you want a special engine (say one that is physically small) and it’s in a crashed car that isn’t popular, you’ll likely get it very cheaply. But there are some major downsides of buying at salvage auctions. There are no warranties and you cannot start the engine, let alone drive the car (if that would even be possible). In fact inspection is confined to what you can see by just standing and looking at the vehicle (well, you can get down on the ground as well). Many cars do not have keys and very few have service books. A 10 per cent deposit is payable on the fall of the hammer and full payment and pick-up needs to occur within a (short) defined timeline. The bid price does not include fees – you should know what these are before bidding. Another point to keep in mind is that sometimes a car appears to sell and yet shows up again in the next week’s auction. Either the sale was too a dummy bidder (illegal? sure), the buyer didn’t cough up the dough, or the insurance company didn’t OK the price. I think it’s best to attend the auction in person, but if you want to take a bigger risk, you can bid at many salvage auctions on-line. The auction may be on-line only, or may be a combined physical and on-line auction. Having considered all of this, and wanting an engine that in outright terms wouldn’t be hugely powerful, I decided to buy the donor car from a salvage auction. I attended an auction, having firstly looked carefully at the pics and descriptions placed on the auction website. When I arrived I found that one of my ‘picked’ cars had been withdrawn from the auction (no explanation given), and the other car that I had my eye on went for too much – I was outbid. But attending was worthwhile as I got a feel for the sale prices. Some cars went very cheaply – literally a few hundred dollars buying a complete car. 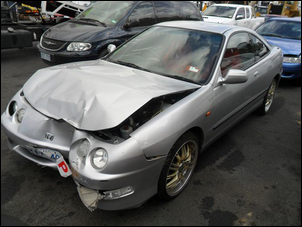 The next week I decided to bid online, and bid on a 1999 Honda Integra that had been lightly hit into a pole. 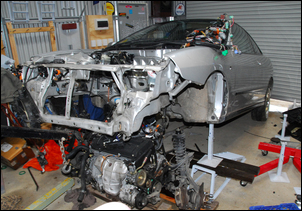 Classed as a repairable write-off, the car had 160,000km on it and appeared (in the photos!) to be in good condition. The engine ran sweetly, the throttle response and flatness of the torque curve was better than I expected, and it seemed to go about right for 107kW in 1150kg. Pretty darn good for a total outlay of under five hundred bucks! 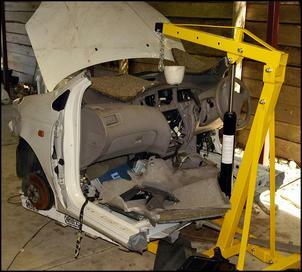 Pulling apart the donor car, the thing that strikes me most forcefully is that you get so much! I want the brakes (complete system, possibly also including the ABS), driveline (including ECU, loom, driveshafts, engine mounts) and fuel system (the whole lot). And of course, with the exception of the radiator, it’s all there. When I have taken the bits I want that leaves for sale the suspension, complete doors, hatch, tail-lights, seats and interior trim, etc. Even if I get only a few hundred dollars for that lot, the total cost is well down. Marketed well, you could in fact expect to make a profit! And it sounds strange, but I reckon I have so far taken out of the car about $50 in high tensile bolts alone - 6mm and 8mm metric fasteners that I usually use a lot anyway. Finally, a complete car that’s still on its wheels is a lot easier to move around than a half-cut. 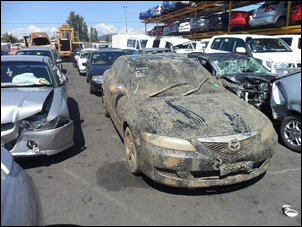 If you have the space to pull apart a complete car and want a whole heap of parts for your new project, consider buying a gently crashed car at a salvage auction.